Last week, weather changed over night and it almost feels like winter some days. I know we only get to enjoy spring and fall for a very short period of time but it's really going too fast. Just like how babies grow so fast. *sniff*. So now, my mini started her solids. She is really growing too fast. Way too fast. Having a baby who needs to be introduced to new foods every couple of days is actually a good thing though. That means I have to plan. No more "throw whatever I have and make a meal literally 30 minutes before dinner HAS to be served". I was a better meal planner when my tot was just starting solids. Because I had to introduce different foods every 3-4 days, I had to shop accordingly. He would only eat about 2oz at a time, so I would have to use the same ingredients for our meal. Then as he started to eat with us and I sometimes got lazy. Actually let me rephrase it, I got busy and more spontaneous. Okay, that sounds much better. After my mini had rice cereal for the first few days, I wanted to let her taste some fall flavor. And we love butternut squash. Roasted, sautéed, wrapped in bacon, soup, you name it. Sure enough, my girl absolutely loved it! She finished the first serving of butternut squash with big smiles accompanied by some squeals. So proud of my big girl. And with leftover squash, we made yummy hash. I like to use chorizo instead of Italian sausage too. It gives a depth to the flavor. But my tot prefers Italian sausage as chorizo can be a little spicy for him. I made this for dinner at 4pm, thinking I'd heat it up and serve it at dinner time but I ended up snacking on the whole dinner portion and that was my dinner. And of course, I had to go ahead and grab a bottle of hard cider for this fall themed "snack time". I was so happy with the harmony of the flavors. Now this is my happy hour. 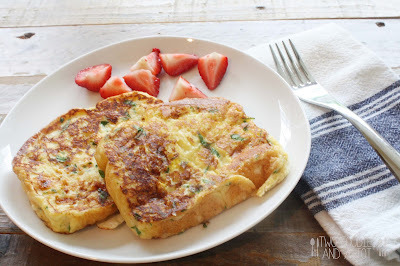 I make this for one skillet dinner a lot but it's also great to serve it as a hearty snack or breakfast with some toasted baguette. 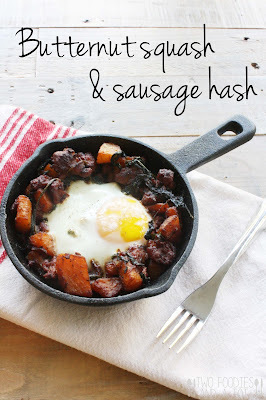 Dip a slice of toasted baguette in the soft runny yolk and top it with some hash. Oh my gosh. Delicious! 1. On a heated skillet, brown the sausage on medium high heat and crumble it while stirring occasionally. 2. When it starts to brown and render the fat, add cubed butternut squash and onion. Sauté for a few minutes and add salt, pepper, paprika and apple cider vinegar and cover. Reduce the heat to medium and cook for 6-7 minutes. 3. Check if squash is done to your liking and add spinach. Cook just until wilted and make small wells for the eggs to stay. Crack an egg in each well, sprinkle salt and pepper, cover and cook just until the eggs are set. Serve immediately. *Or you can scoop the hash into an individual serving vessel, crack an egg each and broil until eggs are set. This way, you get a little more browned hash which I love. 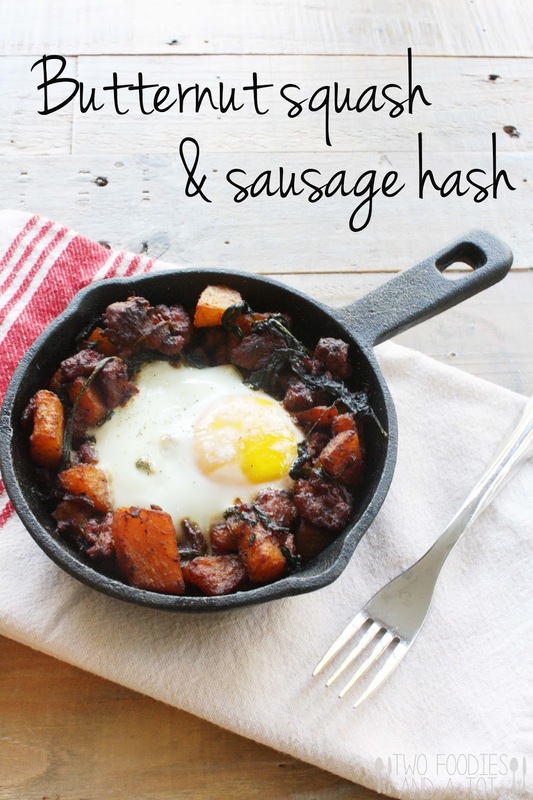 *You can make ahead the hash, warm up and finish with the eggs before serving. Long time no post! Really really long time. For the last couple of months, I have been running around everywhere like a headless chicken. My garage door would open and close about ten times everyday. Here's a little update about my life. My tot started a new school which he goes everyday, then after school activities. Now that mini's old enough to take baby classes, I'm also taking her to classes. There's not a single day that I can just stay at home. I really have a full respect for moms with multiple kids. They're truly super moms! With just two I feel like my head is spinning. A lot has happened in the last couple of months but my tot's love for tofu hasn't changed. He loves it grilled, pan fried, stir fried, even blanched and dip it in sauce. I make same exact thing with chicken instead of tofu for Steve as he can't stand tofu. It is delicious! I personally prefer it with tofu because I love the crispy outside and soft inside texture but Steve loves it with chicken. This sauce is so yummy, I sometimes make a little extra and make the dish very saucy so I can pour it over the rice. Pictures were taken a while ago but now that I look at them again, they look suitable for the fall with nice orange hue from the carrots. 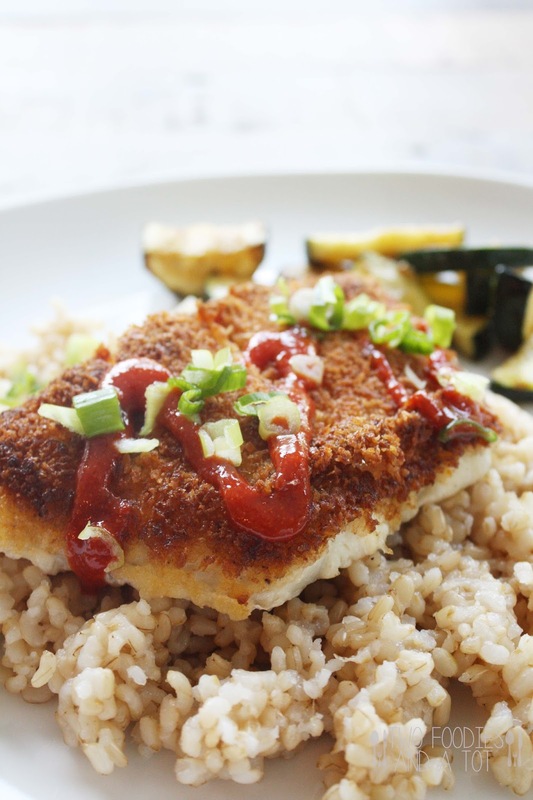 It's a nice and healthy weeknight meal that comes back over and over again on our family's dinner table. 1. Drain the tofu. Wrapped it with some paper towels and put something heavy on top to drain the water out. While preparing other ingredients. 2. Mix the sauce ingredients and set aside. Prepare the carrot with a vegetable peeler so you get carrot ribbons. Cut the tofu into small cubes. 3. 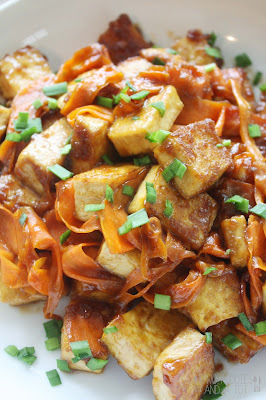 Heat the oil in a pan and cook tofu, preferably cooking all sides for crispiness. 4. When tofu's done, add carrot ribbons and saute them together for 2-3 minutes. Add sauce to it and stir. Cook for a few minutes until sauce is slightly thickened. Serve immediately. As much as I love late summer nights, I am sad that summer's almost over. Seriously, next week is September?! Summer always goes so quickly but this summer was really a blink of an eye. With all the new adjustment with my mini, setting a new routine as she grows really kept everyone busy in my house. Time really flies and she turned 100th day old last weekend. And as Korean tradition goes, we celebrated it. It used to be a big deal but thesedays, it's just a small gathering between family members. So we decided to simply make a cake and no more than that. I've always wanted to make a pretty pink rosette cake and I was so happy I finally have an occasion to make one! All the things I've been dying to make, I can slowly go ahead and do it for my princess. =) Since it's an occasion to celebrate parents' hard work during the first few months and also the healthy growing of the baby , I needed something for the baby on the table. So there we go, the only thing she can have at the moment. A bottle. =) And of course I had some macaroons for my fancy little tot. For some reason he doesn't like cake so much thesedays. He's totally into macaroons. I should make some for him(or myself) some time soon. Not that it's healthy or anything but they're just so good! 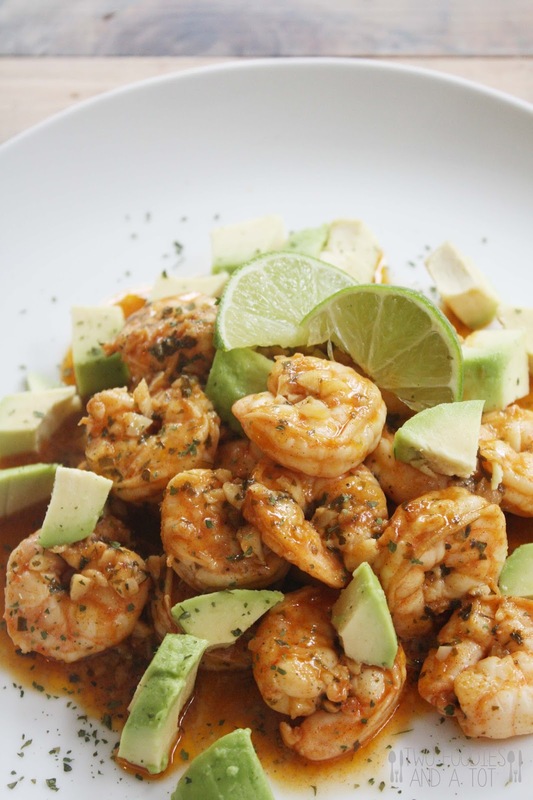 Now, about this summery shrimp dish. I have cooked it three different ways so far. Baking in the oven and finishing up with broiling for the char, put a skewer and grilling on BBQ and sautéing. I like all three ways but when I eat it with some rice, I like to sauté because I pour the whole marinade to make it saucy, cut up some avocado and pour it over the rice. Little tang from the lime and a subtle sweetness with creamy avocado. YUM! It's very quick to make the marinade and it always has been a success for the crowds. If you haven't gone on a proper vacation this summer(like us), give your taste buds a trip to Thailand with some chili lime shrimp! 1. Mix all the marinade ingredients in a bowl. Add shrimp and marinate for at least 30 minutes. 2. Heat up a skillet and saute the shrimp for 3-4 minutes on high heat(or until internal temperature reaches 145F). If you like it saucy like me, pour the whole marinade with the shrimp when cooking. 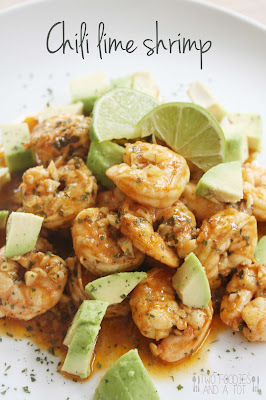 Serve with rice and cubed avocado. * If you grill, soak the bamboo skewers in water for 30 minutes and put shrimps on them before grilling. You can bake them on 400F oven and broil at the end for the char. The other day, Steve was flipping channels on TV and we naturally stopped when we saw my big fat Greek wedding on. It's such a great movie with super low budget and is loved by so many people. As we were watching that movie, I randomly saw someone's facebook post that they're making a sequel. WHAT?! That is awesome! Steve has some Greek friends and they confirmed that a lot of the stereotypes of Greeks are true including windex. Haha. That's pretty funny. Maybe I am wrong but I find them very similar to Italians. Big families, like to have fun, lots of yummy food and so on. They're both mediterranean, so it's probably natural just like different asian countries share somewhat similar culture. Mediterranean food is so refreshing, Steve and I used to be obsessed. Now that the movie has brought us back to the memories, we should make more of Greek food. Steve used to make Greek salad for dinner every single day and not get tired of it, plus he lost a lot of weight. We have a new neighbor who are Greeks, we brought some cookies the day they moved in and met them. Maybe I should bake some more and knock on their door and learn to cook some real Greek food! 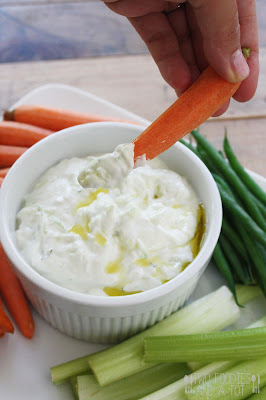 Tzatziki is not only great for gyro and simply grilled chicken, it makes a fabulous dip for crudites, baked pita, potato chips, you name it. Creamy, garlicky yet, refreshing with a whole lot of cucumber. 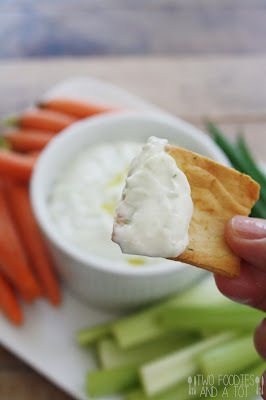 When I want something simple for entertaining without making multiple dips for veggies and chips, I always go with this. Because it develops such yummy flavor as it sits in the fridge, you can make ahead the night before entertaining. Make ahead dishes are always the best when you entertain, aren't they? =) Here's how you bring your guests to Greece at a bite! 1. Scrape the seeds from English cucumber and grate it through large holes of cheese grater. Squeeze grated cucumber to remove liquid and let it sit on a sieve. 2. Mix rest of the ingredients in a bowl and stir in cucumber. Drizzle a little olive oil on top before serving. 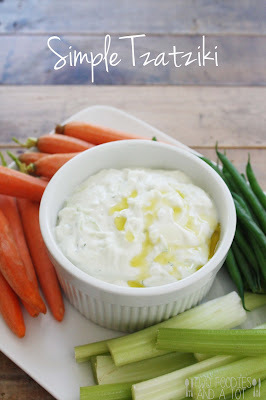 *It's a perfect make ahead dip as the flavor develops as it sits in the fridge. Serve it with crudité of your choice or toasted pita. Having a newborn after over 3 years of uninterrupted good night's sleep has been a challenge. Last couple of months, I am reminded a few things. One, grown ups can act just like a toddler - Über cranky. Two, you can totally feel hungover without a single drop of alcohol in your blood. After waking up a few times a night, my body would feel like someone just beat me up or I drank a whole bottle of vodka and danced all night. My tot was sleep trained very early. By this time, less than 3 months old, he slept through the night on most nights. I find my mini definitely has a lot calmer temperament than my tot(thank goodness!! )but night sleepwise, she's got some work to do. She'd better hurry up and give mama a break. All and all though, it's such a joy. I love her bright smile she gives me when I walk into the room, little kicks that go a mile a minute when she plays and even when she's just staring at the blank space. Everything about her makes me smile. I hate to admit, a day with a toddler sometimes goes so slow that I look at the time all day. But when a baby's around, a day goes by so quickly. By dinner time, I am always running out of time unless I am well planned. The other day, I realized I had cod in the fridge that I completely forgot about. 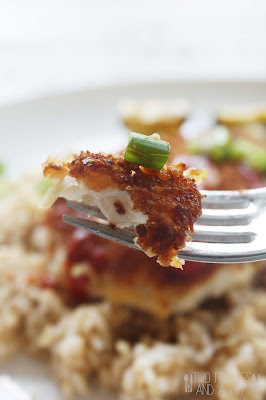 I quickly whipped up one of our favorite fish recipes. 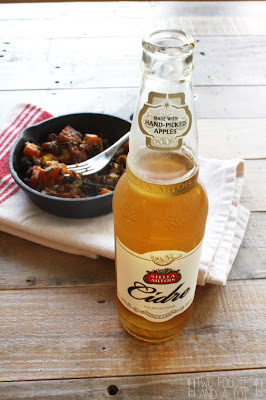 This is so quick and seriously so delicious. 1. Preheat the oven to 375F. Line and lightly grease a baking sheet. Season the fillets with salt and pepper. In a small bowl, mix sriracha and mayo. 2. 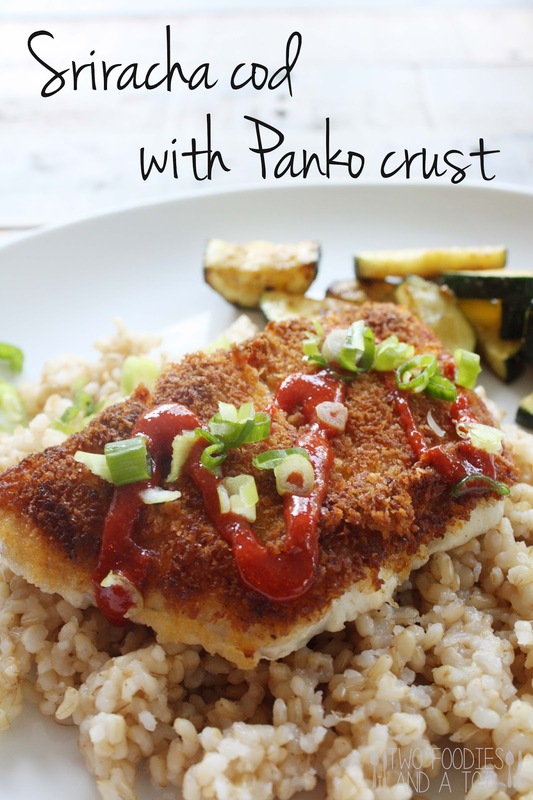 Pour the panko into a rimmed plate. Brush sriracha and mayo mixture on top of the fillet. Take each fillet, turn mayo side down and press it onto panko. 3. 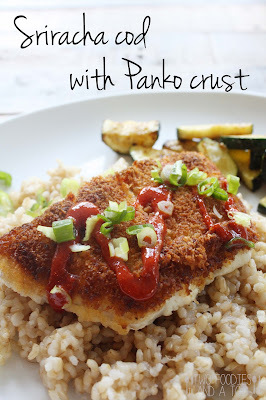 Heat the butter in a pan and brown the crust of each fillet for 2-3 minutes. 4. Carefully transfer the fillets onto the prepared baking sheet. Bake for 15 minutes or so. Cooking time varies depending on the thickness of the fillet - when it reaches internal temperature 145F, it's done. 5. Place it on a plate and garnish as you prefer. I use sriracha and chopped scallion. My beloved Macbook has been acting up like a toddler. Start up disk problem. My gosh, it was so frustrating. I moved pretty much everything on my google drive and back up hard drive but same message keeps popping up. I temporarily fixed it somehow but I don't know when I'll see the message again and it will stop me from uploading pictures. Gotta see an expert. Well..that is why I haven't been able to post for the last couple of weeks. My mornings has been going so fast lately as my tot has two weeks break from his camp and we haven't been on a strict routine. Which means, our usual consumption of banana with yogurt for breakfast has slowed down. While I'm being lazy in bed with my mini, tot would go downstairs and get some cereal for breakfast. I felt like a terrible mother for not giving him proper breakfast but gosh, these two weeks of growth spurt period of my mini was pretty rough. She would eat every 2hours or so all over again and by the time my tot wants his breakfast, I'd be like a zombie. So that left us with some overripe bananas. As always, my solution to overripe bananas was banana bread. 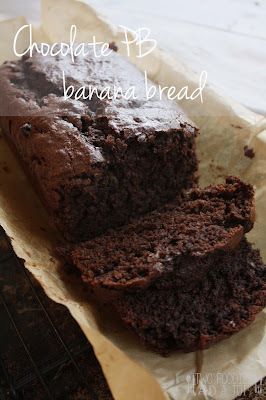 But I didn't want the same old banana bread, plus I craved something chocolatey. 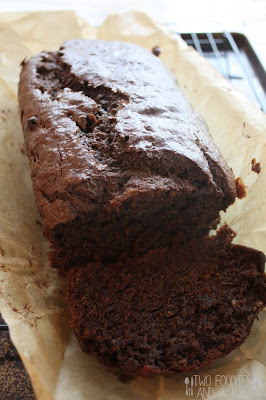 This chocolatey, peanut buttery goodness is so moist and yummy. Steve is not a huge fan of banana bread and even he loved it. I warmed up some peanut butter in the microwave and drizzled when I served it. Oh my...it's heavenly. And the fact that it's healthier and I used up the bananas before they go bad made me feel good. Usually a loaf of banana bread lasts for many days in this house as it's just me and my tot who eat it. But this loaf disappeared very quickly. So yummy. 1. Preheat the oven to 350F. Line a loaf pan with parchment paper. 2. In a large bowl, add peanut butter, sugar, mashed bananas, oil and eggs. Stir well to mix. 3. Add rest of the ingredients, adding flour the last. 4. 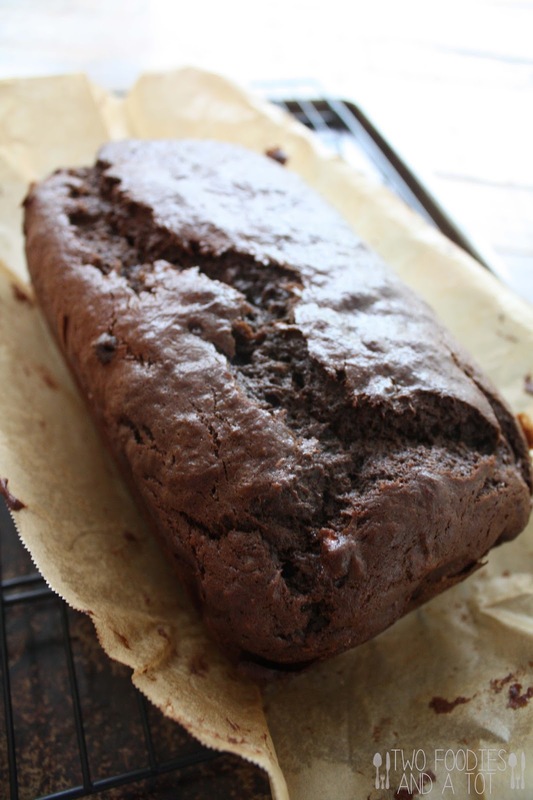 Pour into a loaf pan and bake for 55 minutes or until toothpick inserted in the center comes out clean. 5. Cool the loaf. Melt the peanut butter and drizzle before serving. If you know me or have read my previous posts, you'd know my love for French toast. And I love sweet and savory together. This savory French toast is the perfect combination for that sweet and savory cravings. Custard itself doesn't contain anything sweet, so if you like savory toast alone, you don't have to add maple syrup to it. It's probably nice with some smoked salmon and hollandaise sauce too. Soft and eggy brioche bread with cheesy custard. Yum! Thanks to my mini going back to sleep in the morning, I got to catch up my lost sleep due to night feedings. Meanwhile my tot nagged Steve, daddy I'm hungry! Breakfast please!! That's my boy. He chose daddy to go downstairs with him. By the time I went downstairs, they were done with their breakfast and playing with playdoh, Steve looking like a zombie. I, on the other hand, luxuriously slept a few more hours in the morning and made myself some delicious savory French toast. I felt so bad. But then Steve has been away on a business trip which means he got to enjoy undisturbed good night's sleep for days while I'm on night shift all by myself! 1. 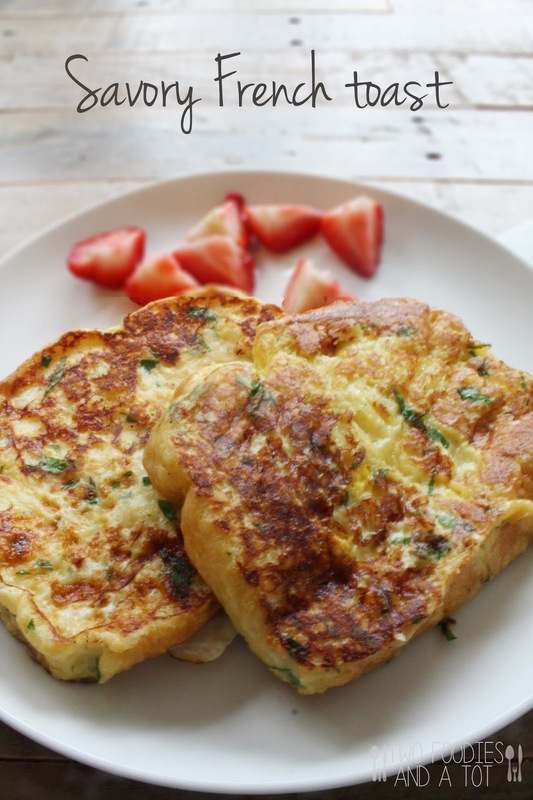 Whisk together eggs, milk and Parmesan. Add parsley, salt and pepper. 2. Coat the bread with the egg mixture and cook on a heated and greased griddle. 3. 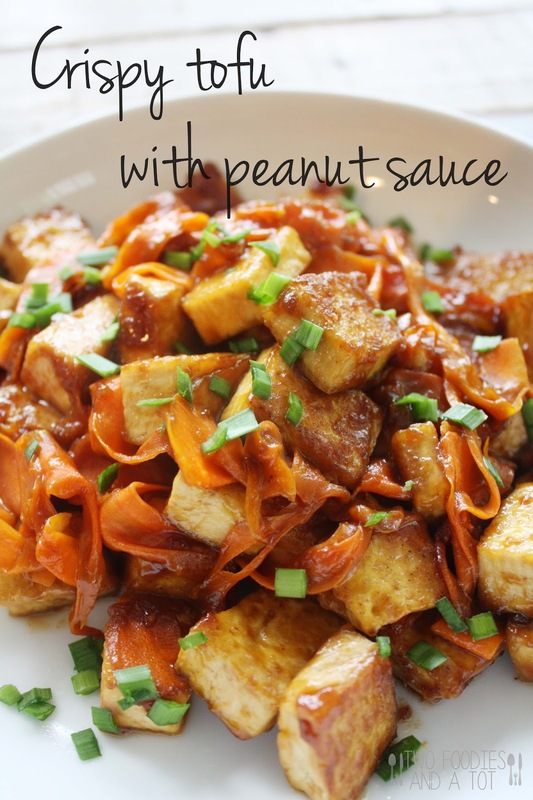 Serve with maple syrup(if you like sweet and savory together).